Sergio Mendes…If It Was Good Then, It’s Still Good. I currently find myself in a difficult situation, now that “Mad Men” Season 4 has recently concluded, which leaves me and my other dedicated and faithful followers ravenous for more swingin’ Don Draper action. Options to alleviate this dilema include A) re-watching ‘Mad Men’ Seasons 1-3 all over again obsessively until the start of Season 5, or B) listen to some swingin’ 60s records in hopes it’ll pass the time. With thanks to my grandparent’s hidden treasure trove of bitchin’ 60s vinyl I think I’ll be able to get my Don Draper-like fix for the next few months. I honestly had no idea how groovy my grandparents were (and still are I should add) nor how groovy their record collection was. Most of the records had been sitting in boxes in my studio for the last few years until I finally decide to flip through and assimilate them into my collection. 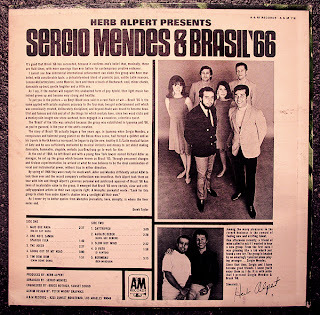 As I was anxious for my next ‘Mad Men’ fix it was this moment that “Herb Albert Presents Sergio Mendes & Brasil ’66” practically jumped off the shelf and onto my turntable. I’m so very glad it did, too! The fluidity of the Bossa Nova sound is peppered through out this record, with a delicate and calculated mix of piano jazz, a hint of Henry Mancini, a dash of Burt Bacharach, topped with a danceable swinging flavor that will have you drinking fancy cocktails with little pink umbrellas in no time. Aside from ‘elevator music’ and maybe a Miles Davis record or two, I can’t think of another exotically enticing record that makes me feel like I’m smack-dab in the mid-1960s. Like all hit records though, this one could definitely use more, as my only complaint about this album is it’s way too short. I can only imagine at the time of this record’s infectious release, 1966 looked like one enormous Latin Jazz dance party that would only end when the rum ran out. An album this good isn’t put away at the end of side two. This is a record you flip over and over, constantly, like I’ve done over the last few weeks, trying to find the right words to do this album justice. I first took notice of the name Sergio Mendes in 2006, when his “Timeless” remix album was released, capitalizing on a new generation and audience of listeners. I never really followed up with what the man or his music was all about. As I always say, music finds the listener when the time is right, and fortunately for me, the time finally was now. I’m currently on a mission to find more records like this beauty, not to mention a killer martini bar that belongs in a home with records like this on the shelf. 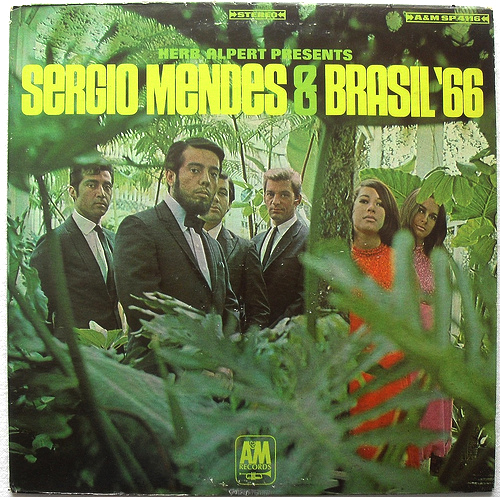 “Mad Men” or no, I think I’ll be able to handle myself with a healthy dose of Sergio Mendes & Brasil ’66 for awhile, and perhaps finding a way to mix the two without overdoing it. I still have much to discover within the sounds of Bossa Nova and Latin Jazz/Lounge…whatever you want to call it. But, I think that’s the great thing about this blog, being able to discover new things for myself that can be passed onto the other curious music fans out there. 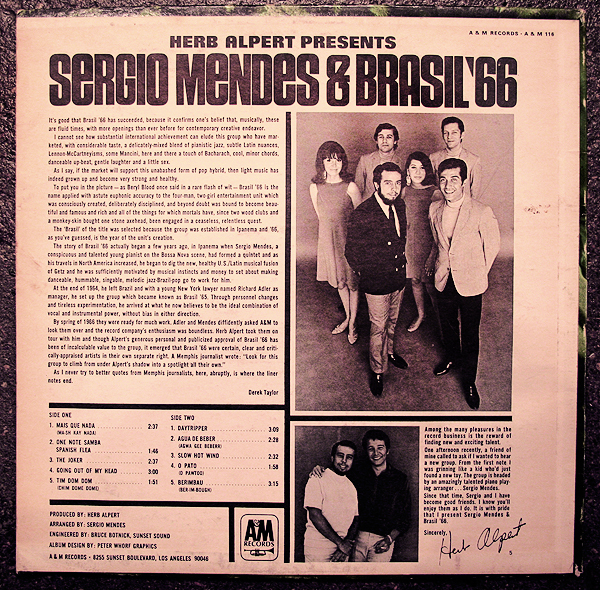 Get a taste of Sergio Mendes & Brasil ’66 at Amazon, and then be sure to pick up this album on vinyl for your next cocktail party. This entry was posted on Friday, November 5th, 2010 at 12:37 am	and is filed under Music. You can follow any responses to this entry through the RSS 2.0 feed. You can leave a response, or trackback from your own site. « Here Is Some Concept Artwork For The Upcoming CGI Wizard of Oz Film! !